Burnout Paradise: Remastered is similar to the Definitive Editions of Tomb Raider and The Last of Us on PS4: it’s the original game with some graphical bells and whistles plus all the DLC. The original game was famed for its forward-thinking updates: a full year of free DLC followed up by a second year of even better paid DLC. Criterion added Online Challenges and modes, bikes, a day/night cycle, Party Mode, Legendary Cars, Cops and Robbers and Big Surf Island, among many others. The last two items are significant because The Ultimate Box, the only PC release, never received the later DLC content in an official capacity. 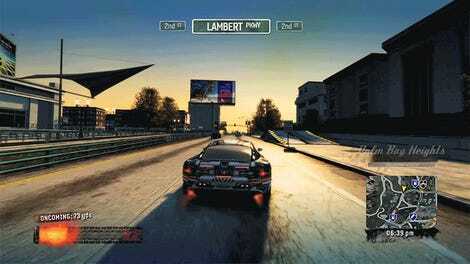 I’ll get this out of the gate right away: both Burnout Paradise and Remastered are fantastic games. There are similar titles out there, including those made by Criterion such as Need for Speed: Most Wanted from 2012, but none manage to capture the blistering speed, arcade handling, open-world freedom and gratuitous vehicular destruction quite like Paradise does. As Digital Foundry discovered, Remastered is no mere port of the PC version. It features numerous improvements like better texture resolution, shadow rendering, blooming, and anti-aliasing, as well as more sparks, smoke and dirt clouds, with all improvements applying to both 1080 and 4K consoles. All of the graphical touches feel very well-considered with the game as a whole, which isn’t a surprise since Stellar Entertainment has Paradise’s Creative and Technical Directors, and the end result is very appealing compared to the original. Many of the textures have been given resolution bumps, including graffiti and paint scratches. The Soundtrack is a remarkable achievement in licensing considering the sheer amount of music in the first release. In addition to the classical music and Burnout 1, 2 and 3 tracks from Stephen Root, all but two of the licensed “radio” tracks are back as well. This does wonders in retaining the original atmosphere of the game and raises hopes for remasters of other classic EA titles like SSX 3 or the older Burnout games. So how does the game itself hold up in 2018? When it comes to the core driving, incredibly well. Paradise’s car handling is as perfect as arcade racers come, where the cars are lighter than the likes of Need for Speed but not unrealistically so, and every one of them has an immediately identifiable character, ranging from effective tanks to slippery speedsters. The classic Burnout features of fast driving, earning Boost and crashing are as great here as they ever were. Racers don’t come much faster than Burnout without going futuristic, and much of the end-game challenge comes from interpreting the blur of objects ahead of you and remembering when the next turn is. The Stunt and Speed-class cars are rewarding to play with, although Aggression boost (earned through destroying stuff) still plays rather awkwardly even when just driving around. The vehicle deformation and debris is impressive even today. Cars just don’t get wrecked like they used to. The crashes remain stunning: there’s still nothing quite like seeing the entire front end of your car compress in slow-motion when hitting a bus, and the added debris flying off your car is both gratuitous and satisfying. Drifting meanwhile is an art, and managing it to perfectly go round a bend at top speed whilst keeping the Boost flowing is the best feeling in the game. Probably the most unique aspect of Paradise is the online, which has been retained and is fully functional in Remastered. Rather than being just races with real people, up to eight players can drive about Paradise City in Freeburn mode and complete various co-op challenges, such as accumulating a drift distance total on a dirt track or barrel-rolling over all the other players at the beach. This makes the game a lot friendlier and just plain fun than other, more competitive-focused titles, and you can still initiate classic Races and Road Rages if you want. It’s easily one of Paradise’s standout features and is still unique today. Much of what’s decent in the game comes from its original 2008 release. For better or worse, the game looks much as you remember it, and while the graphical updates definitely help, it still looks like a game from a decade ago and as such appears basic in a lot of places. GTA V it is not, and it retains the hesitance to really show off the game world outside of the streets you drive on, be it via the environment design or the way the camera works. If you do happen to catch a glimpse of the world in the distance, you’ll find a very sparse and rudimentary landscape obscured in a slight haze. It’s probably why Stellar Entertainment opted not to put in a Photo Mode like The Nathan Drake Collection did. An interesting facet introduced by the Definitive Edition-style release is how the game handles the added patch and DLC content (or rather, doesn’t): it’s still there under the assumption that you’re familiar with the original. The most obvious effect is the plethora of cars available at the start: Toy Cars, Bikes, movie knock-offs and more are all open from the start before you even know what an Auto Repair is. For returning players this allows for an incredibly convenient way to quickly get back in the groove, but for new players it’s an overwhelming amount of opening content in an already overwhelming game. Unlocking the DLC additions through gameplay would have really helped add incentive to complete the endgame, which has sparse unlocks. The Extreme Hot Rod was one of the later pieces of DLC, which boosts forever until you brake or otherwise “forcibly stop”. Further, many of the added features assume you’ve read the old patch notes, and as such are never properly explained in-game. If you didn’t know that Easy Drive allows you to instantly retry the last event, you’ll be backtracking to the start after a loss just like when the game first launched. The same applies for changing the time of day, using the fan-made car liveries, or accessing the two online-only vehicles. The actual long-term gameplay structure is another matter entirely. Unlike the unlock-based closed-circuit street racers from the PS2 titles, Paradise takes open-world freedom to the extreme. All events start at intersections over every square mile of the game world and can all be found at any point. Clearing events will earn points on your license and unlock new cars, and upgrading your license with enough points resets all the events so that you can clear them again for the next license upgrade. While this is cute at first, it deteriorates when you have to complete some events six or seven times over to fully complete the game. Further, unlocking cars is laborious: after completing enough events, you have to encounter one in the game world, turn around and catch up to it, and then force it to crash, after which you have to drive all the way to a Junkyard and then fix it at an Auto-Repair. It’s a far cry from the convenience of having a factory fresh car unlocked immediately. There’s an event located at nearly every intersection in the game. That’s a LOT of events. The structure for races meanwhile was contentious back in the day and it remains somewhat awkward in 2018. Rather than routed racetracks, events utilize the entire open-world, with Races and Marked Man events being limited to eight finish lines located at landmarks at the edges of the map. This often means that you’ll find a reliable route to each and stick to those, rather than experimenting with shortcuts and using interesting paths like the game wants you to. Stunt Runs devolve into hitting tried-and-true stunt locations every time, while Road Rages devolve into driving forward and taking the occasional forced corner at a T-junction. It’s a neat concept and it would have worked very well as an alternate event series alongside traditional routed ones, but applied to all events it struggles to hold the campaign up because all of them feel samey. Routed tracks from the PS2 titles worked because you always had to make daring high-speed drifting turns that dictated your approach, but in Paradise players will stick to the straightest and easiest path, not the most interesting one. This is somewhat rectified in the Big Surf Island events that utilize Checkpoints, but since they number only a handful, it makes no impact on the broader problem. The number of truly disappointing aspects is small, but still noticeable. There’s a new and rather strange road texture replacement that noticeably clashes with the other gritty and grimy textures due to how clean it is, and it sticks out like a sore thumb every time you come across it. As well, almost all of the billboards are new but generic, replacing the real-life Levi ones as well as the goofy and often crude-humoured custom billboards, like Crashbreaker Laxatives, added in the final update. It’s minor but it removes some of the game’s character from the end of its life. But hey, at least Obama isn’t advertising anymore! On top of those are content offerings from the original release that stretch the playtime. The Online Challenges number exactly 500, and almost all of them share the same tasks but with different player counts, while an entire section is dedicated to the oft-ignored Bikes. As well, the Bikes have Day and Night versions of Events and Time Road Rules, making all of it come off as padding to make it “the biggest Burnout evar!”. And yes, Showtime Mode is still a poor replacement for the old Crash Mode. Racing is and has always been the best part of Burnout. Click to view the lack of transparency in the Remastered icons. I mean, just look at the above image. The top two rows are the diverse icons for the original Paradise, and the bottom one is Remastered’s. What exactly was wrong with the original Trophy icons? They’re exactly the same size (240 x 240) and are a heck of a lot prettier than the copy/paste look for Remastered, and they aren’t even transparent! It just comes off as cheap and lazy, which is very unlike the rest of the package. Do not let the above complaints fool you, though. Burnout Paradise: Remastered is still a solid and incredibly fun racing game if you can get past the event structure. It will last you a long time, is unoppresive and features a wide breadth of cars to try out and suit your playstyle: fun comes first and foremost. The lack of quality-of-life improvements is a shame, but the remaster does a great job of retaining the magic of the original title. In my opinion it easily supersedes the original, despite it being available on Xbox One’s 360 backwards-compatability.